Assistant Professor Yamen Saraiji at Keio University’s Graduate School of Media Design in Tokyo demonstrated the robotic arms to MIT Technology Review via video conference. 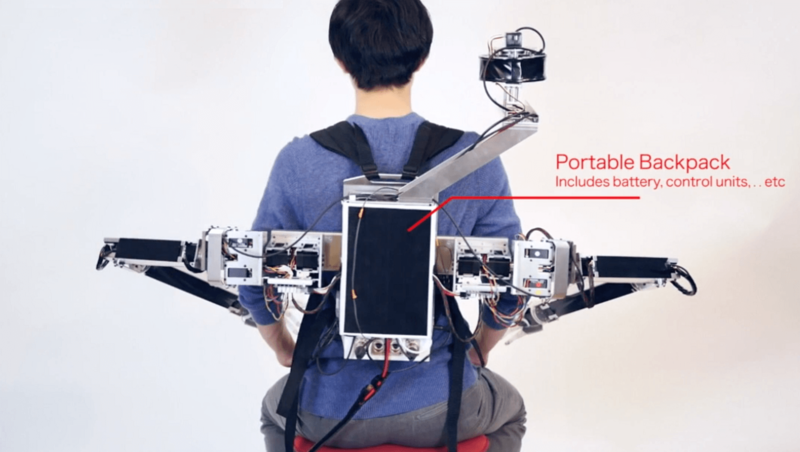 The 21-pound device consists of two arms each with seven points of articulation, a third appendage that acts as a head with dual cameras, and detachable hands. The unit is controlled via an Oculus Rift headset and two handheld controllers. This means it requires two people to operate — one wearing the backpack and the other using the Rift. Having two operators is not very practical, but it could be used in certain situations such as teaching someone how to operate machinery remotely or helping someone in a physical therapy setting says Saraiji. Hermano Igo Krebs, who is a principal researcher on rehabilitation robotics at MIT says that the device would not be practical for rehab. However, he does think that it could serve other useful purposes such as being used during spacewalks requiring two sets of hands. One astronaut could wear the backpack while the other controls it from the safety of the spacecraft, thus only putting one person at risk. The operator controlling the arms has a view of whatever the person wearing the backpack sees. The dual cameras are mounted on a long hinged limb that can pivot over either shoulder so that the wearer’s head never obstructs the operator's view. The stereoscopic video feed replicates our sense of depth perception so that it is easier to manipulate objects. Two controllers are used to moved the hands and grasp things. The hands each have five fingers, but only the thumb and forefinger can function independently — pinky, ring, and middle fingers are all controlled by one button and move simultaneously. The hands are sufficiently articulate to pick up small objects like building blocks or pencils. However, the operator did struggle a little bit with the fine motor controls a little bit during the demonstration. The hands are removable and can be replaced with straps that go around the wearer’s wrists. In this way, the operator can take control of the wearer’s arms at will. This is likely how Saraiji saw the device being used in a rehabilitation setting. Although it is just a prototype now, Saraiji and his group of students would like to see their creation turned into an actual marketable product. They are currently seeking help from a Tokyo-based “startup accelerator” in getting the project from the lab to the marketplace. madboyv1, Reehahs, SirChocula and 1 other person like this. So it is an electronic monkey on your back... Wear it if you dare? Cool. Let's override the safety protocols (if it has any) and see if your arm can bend in THIS direction.